You can be assured of a friendly and professional service from our ski team which goes far beyond that normally offered by the large skiing operators. 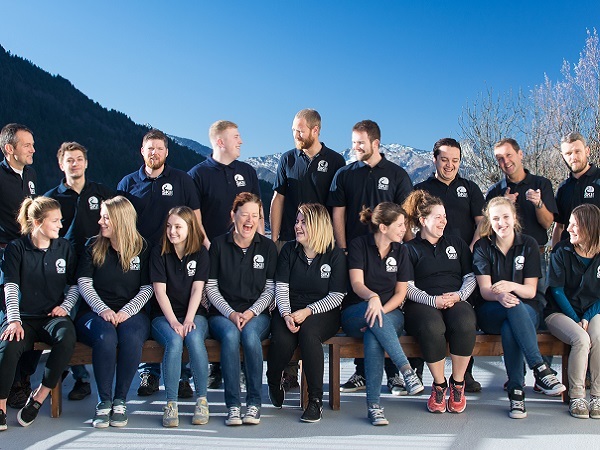 Your dedicated Ski Weekender team will be there to look after every aspect of your time with us and are always on-hand to help you relax and unwind in a great setting. Whatever you are looking for out of your holiday – you can trust us to take the hassles away from your trip – after all, you are on holiday! Although mostly all based at our Aravis Lodge you will see the our welcoming Drivers and Reps in other accommodations and at Geneva airport. Our office based team are just a quick phone call away, and have a huge experience of all of our resorts, accommodations and how to help you get the most from your time away! We have finished recruiting for this coming winter season 2018 / 2019. If you are interested in working for Ski Weekender next season please visit our recruitment page which has full details of all the job roles we will have on offer and how to apply for them. Please see below for our Ski Team for the 2018 / 19 season! Ski Weekender’s founder, used to be a snowboarder but is now to be found more often on skis. Although largely office based these days he enjoys grabbing a pair of skis whenever he gets the chance to accompany guests for a quick ski in all of our resorts. A fan of a cheeky beer of an evening, he is often in the lodge bar chatting before dinner. Five years after moving here from southern Turkey, Teak is now well settled in the Aravis with his family. A keen skier and road cyclist, Teak will be helping Paul with general operations around the business, and always up for a chat over a beer to talk about great days out on the slopes or in the saddle. Britt has been a part of the office team since the summer and is about to experience her first, much anticipated, winter season. Having lived in several different countries over the past 6 years, the Aravis is home for now – although this area does remind her of her homeland in New Zealand with the amount of cows and kiwis that were around over the warmer months! Sharon is on her 2nd winter season with us, where she is currently heading up the sales and reservations team, having also spent 3 exciting summers with Bike Weekender (being a big fan of pro-cycling). Although she’s a snow and mountain-lover, you’re more likely to see Sharon sporting a camera than a pair of skis, so you’d better watch out when she’s around! Having graduated from Teesside Uni with a crime scene science degree back in 2007, Rachel spent 9 years working for the police until she realised life was too short to spend it monitoring bad guys. So I packed a bag and went for a long wander, travelling around South and Central America. Whilst there she decided she wanted to work a ski season, all that sun was too much for a ginger! She spent 3 weeks in the Aravis with her partner Nick this summer and loved every minute! Halli has just graduated from the University of Gloucestershire with a BSc Sports Therapy degree. During her time at Uni she loved playing volleyball and socialising with her team and friends. She’s a beach girl who loves the sea, sand and sun, but equally loves skiing and the mountains. Halli is looking forward to meeting you all, hosting around the lodge and making sure you all have an unforgettable holiday. She cannot wait to experience her first winter working in the mountains! Having just gained her Masters degree in Electronic and Electrical Engineering (changing a plug is still a challenge…) she is looking forward to swapping coding and long hours in the lab, for rock climbing, Munro bagging and trail running. All via working in the hospitality industry last summer, to front of house for her first winter season, sharing her love of skiing and the mountains with everyone she meets. Briar has recently graduated from Plymouth University in 3D design. While at university she worked in hospitality, constantly interacting with new people which she loved. She cannot wait to come out to the Aravis Lodge to meet new people and enjoy a ski season with the team and guests! Although he hails from sleepy Shropshire, Henry has spent his last few summer seasons as a mountain bike leader and windsurfer in Greece. Having lived and worked in New Zealand for nearly 2 years prior, you’re more likely to find him wherever he can get his next adrenaline fix than anywhere sleepy. His first season here at the Aravis, here’s hoping to many more! Gabby loved it at Ski Weekender so much she has come back for another season! Her homeland is the South Island of NZ, however over the last 12 months she’s been living the dream, working and travelling her way around Europe/UK. Though, she is very much looking forward to heading back out to the Alps to shred the slopes, as well as to ensure all the guests have an unforgettable holiday! Ed recently graduated from the University of Bath in Economics and has spent time working in London and New Zealand. Looking to escape an office-based job, this is his first season in the mountains. Ed loves being outdoors and enjoys snowboarding, hiking, rock climbing and sailing. He will be responsible for getting you to and from resort safely, and helping you make the most of your time on the slopes. Nick has spent over 10 years as an electrician previously working 4 months in Antarctica, before spending 14 months travelling to south and central America totalling 45 countries travelled over 6 continents. Now here working his first ski season, something that he has wanted to do for many years. Nick will be mainly in charge of keeping the hotel in good running order and making sure that your skis and boards are in top condition for your time on the slopes. After spending the summer on a Greek island, Jen’s living the dream and spending winter in the snow. A keen skier (might even be brave and learn to board) having worked in the Australian ski fields and the USA, she is really looking forward to a season in the alps. Abbie is joining us for her first ever ski season as part of the housekeeping team. A nurse, swapping the wards for the slopes, she is fulfilling a longstanding desire to be out in the mountains. A junkie for all things active, having run multiple marathons and a triathlon, she was first taught to ski in Scotland by her uncle – look out for her somewhat ‘unique’ style. A proud Welshman who loves the great outdoors, meeting new people and Liverpool FC. Daniel has been working within the property industry for the past 5 years and is looking forward to working with us in the Alps for the first time this year, ensuring everyone is having a fantastic time. David, originally from York, where he ran the many kitchens at York racecourse for more years than he cares to remember. Finally deciding it was time for a change he moved to Spain, during the summer working in restaurants and now spending his winters in the Alps. Loves the sun, sea and sand, rock climbing, fishing and gardening to name but a few.